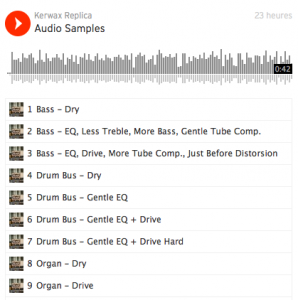 KERWAX Studio is a residential and all-analog recording studio located in a former boarding school in Brittany. 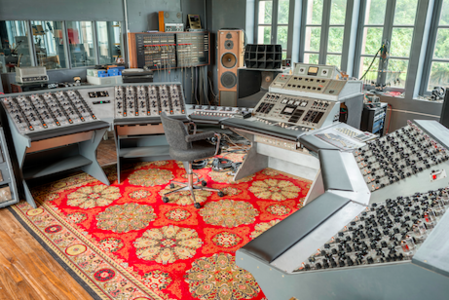 Fully loaded with an exceptional collection of analog vintage gear from the 1940’s to the 1970’s, it hosts an internally developed 24-channel vacuum tube mixing console to meet the requirements of in-house sound engineers and producers. The Replica includes 2 channels of this unique mixing console, integrated into a compact 5U rack enclosure. Its design, inspired by 50’s and 60’s tube amplifiers, allows to fully exploit intrinsic properties of vacuum tubes such as natural compression, saturation and distortion, which bring colors and textures that can’t be found in today’s digital audio products. 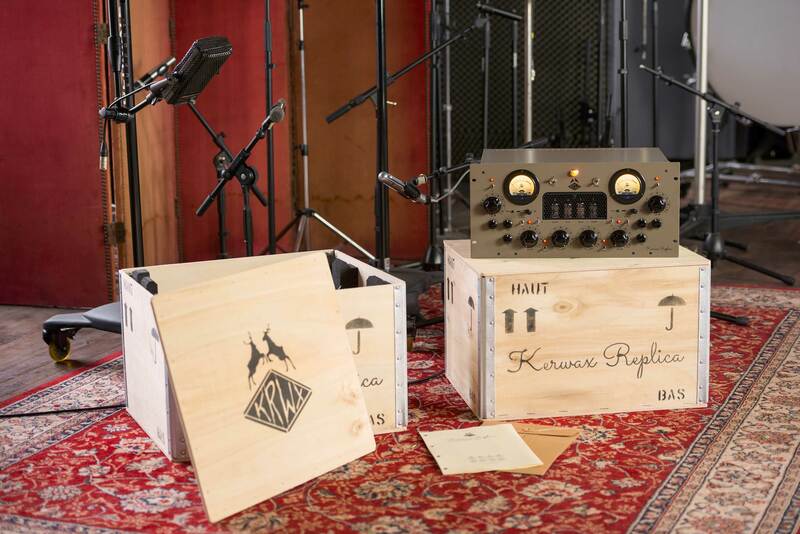 The KERWAX Replica has been developed at KERWAX Recording Studio, a residential facility located in Brittany, France. 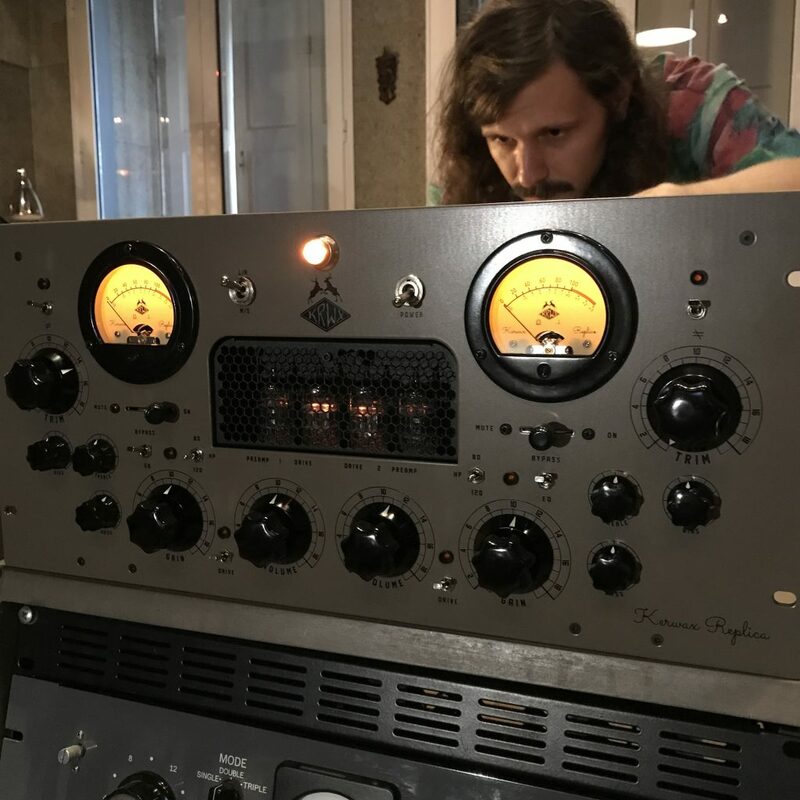 Its unique design features easy change and combination of tubes, to sculpt and color the sound artistically, with either vintage or modern tubes. The controls interact with each other to create a wide variety of tube harmonic distorsion characteristics. Pick the tubes, shape your sound. Why choosing the Replica ? Built with the best materials and audio components, the KERWAX Replica is a window to the golden-age of recording studios. Now, you can build your distinctive sound, and stand out in the digital crowd. You can easily warm-up and add distorsion to any input audio signal: use Trim and Bias settings to adjust depth of sound and produce harmonics, and select Drive function with Gain setting to add progressive saturation to the sound. Thanks to its gentle Baxandall curves, the integrated treble and bass EQs are very musical and smooth. In case you need to remove some harmful low frequencies, a High-Pass filter allows you to choose between 80 Hz and 120 Hz frequencies. The possibilities are endless: experiment and enjoy! 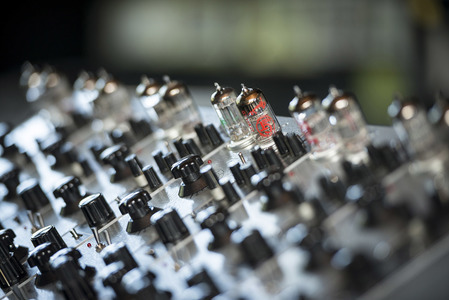 The KERWAX Replica uses two vacuum tubes per channel: the first one for preamplification, the other for saturation. We selected 12AX7 reference because it offers the best audio results for a wide variety of sources. However, if you want to experiment and obtain different results, the tubes are replaceable. You can use all references from the 12AX7 family. 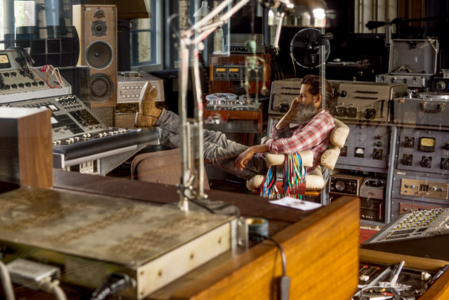 KERWAX Studio is a residential all-analog recording studio located in a former boarding school in Brittany, France, fully loaded with uncompromising vintage analog gear from the 40’s to the 70’s in a 1350 square-meters floor space. Christophe Chavanon started his career as a guitarist, but later studied art and design. It fueled his interest for – as he says – “good-sounding, as well as good-looking stuff, which led [him] to collect gear that has a lot of soul, at a time everyone else went digital“. As a producer, Christophe Chavanon has recently been involved in projects with Rover, uKanDanZ and Mütterlein, and recording clients include Thomas Fersen, Slow Joe & The Ginger Accident, Mr Day, Lou Doillon, Equus, Innaters and Professor Wouassa. Since 2015, KERWAX Studio and RecordingTheMasters teams have shared their passion of analog recording. RecordingTheMasters started to create products from KERWAX prototypes since April 2016. With the Replica, the audio community is able to shape its own magic analog signature. “The Replica is a 2-channel vacuum tube processor, with a preamp circuit and a selectable drive circuit, that uses a different tube. In the preamp section we have the option of changing the bias amount, which can modify the “feel” of the tube stage. After the preamp comes a very useful HPF, selectable between 80 and 120Hz, which can remove some of the low end rumble before feeding the drive stage. Playing with the gain and volume knobs, we can add a light crisp to the signal or mangle it with beautiful tube distortion. There is also a simple but beautiful Baxandall tube EQ with just treble and bass controls, that we can engage after the preamp and drive stages. The build quality is outstanding, and the Replica leaves you with the impression that it will provide plenty of years of use without issues. After a couple of months using the Replica, I’ve found it to be surprisingly versatile for a line preamplifier. Using just the preamp circuit it’s easy to give a very classic tube quality to the signal, while compressing it a little in a very musical way. Even without going into distortion, it makes the signal sound “wider” and more three dimensional. Engaging the drive circuit opens a myriad of sonic possibilities. I’ve used it in multiple sound sources, all with great results. I even ended up using it on the lead vocal of a very modern pop mix, and it gave a lot of size to the vocal and nailed in the center of the mix without sounding distorted at all. Electric bass is also a strong point for this box. Besides adding size and definition to the notes, we can also get a very cool growl from this processor (and the EQ sounds wonderful on it!). Drums are also a very obvious choice when it comes to the Kerwax Replica. I was mixing a garage-rock record a couple of months ago and found myself using one channel of the Replica on the drum bus (mono drums) and another for lead vocals, both running in parallel with the main busses. It was super easy to get the grit I was looking for! Capturing a vintage drum kit with just 2 mics running through this machine is also something that brought instant smile to my face. The Replica can be used in a L/R or M/S configuration, and I really loved the latter for stereo bus duties like drums, guitars and even the mix bus! I’m using the stock tubes in our unit, but the manufacturer suggests trying out different tubes to open up the sonic possibilities (and they made it really easy to swap them, putting them on the front panel). Kerwax Replica is unique device. It allows you to choose between two audio modes : Standard Left/Right for individual track processing or Mid/Side to control stereo image, ideal for mastering operation. * Ensure that no condensation occurs. We will be discussing here one of the two main audio modes – and major feature – of the KERWAX Replica: the M/S (Mid/Side) mode. What is the M/S mode? Most studio devices process the audio signal in a conventional manner via a stereophonic process. Mid/Side, commonly abbreviated as “M/S”, is a special audio processing, often used in mastering. How does it work and what is its interest? The M/S allows you to overcome the constraints of the stereo link during audio processing by breaking the source into a Mid part (center) and a Side part (lateral). It is thus possible to work separately these two sections by adjusting the central presence (thanks to the Mid), or the width of the sound stage (thanks to the Side), all without altering the original stereo signal. The output signal is then usable normally to be integrated into a current mix or to create a master. This function allows you to avoid the use of more destructive treatments and not to distort the audio signal. It offers a precision retrospective adjustment, which is difficult to achieve in standard stereo mode. – Apply effects (compressor, equalizer) on the Mid or Side, independently of each other. The possibilities are endless, as much by the number of adjustments possible, as by the type of use desired: on an instrument, a group of instruments or a complete mix. This M/S mode is integrated into the Replica, in addition to the standard L/R mode. It is then possible to add saturation or distortion to Mid and/or Side signals using the 2 integrated tubes per channel. Therefore, you have a tremendous audio processing tool, bringing colors and textures that can’t be found on today’s digital devices. It is not only suitable for mastering but also for sound creation, all in a compact package of only 5 units. Not only the Replica has high quality construction, but also excellent audio properties. Its sound has been carefully adjusted for months and validated at KERWAX Studio; its versatility makes it naturally compatible with any music style or instrument.